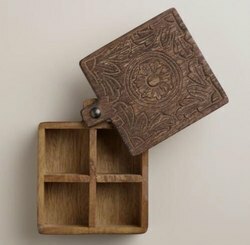 This interesting wooden spice box is design for you to store your spice in style. So as to accomplish high level of customer trust, we are keenly betrothed in offering CWC SS Spice Container. We manufacture fancy looking spice containers which are air-tight, made up of food-grade material and at competitive prices. These spice containers aid in keeping spices fresh. Rect and round spice containers have 3 dispensing covers is made out of food grade PP.